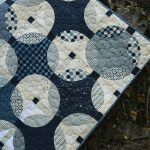 Welcome to the second installment of the Doll House quilt tutorial using the Classic Curves Ruler. Thank you to those I have heard from about this quilt. 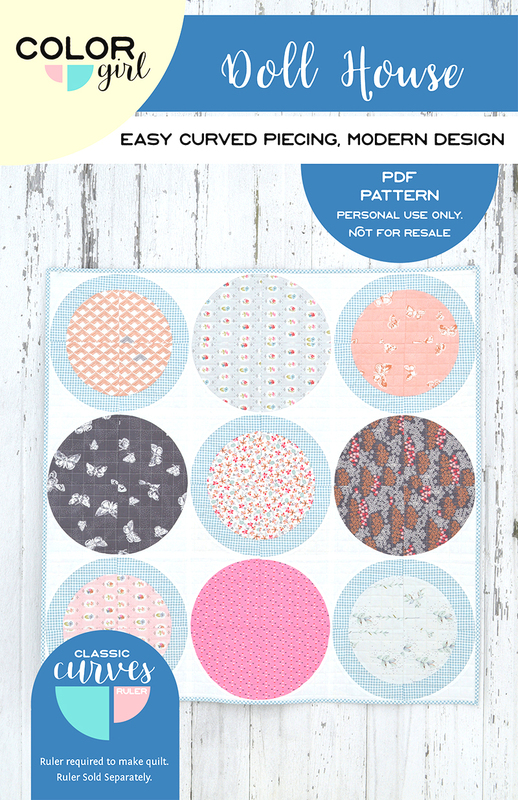 I am so excited that you like the quilt and would love to see what you are making with the pattern. 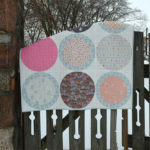 If you missed it, look at last week’s post for details on the quilt, supplies, fabric and cutting instructions. Our quilt is going to be 39″ square (easily made bigger by sewing more blocks). Last week we did all of our cutting, now we sew! Turn the white fabric right sides facing the print fabric. Pin the fabrics at the marked points, plus the ends of the curve. Using a ¼” seam allowance, carefully sew the curved edge. Keep the fabric edges aligned and avoid pulling or stretching the fabrics. Remove pins as you approach them. Open and press toward the A shape. Make 16 of these units. Trim each sewn unit to square at 7″. Leave ½” of white to the outside of the print fabric at both ends of the curve. (see illustration 2 above). Divide the sewn units into groups of four with matching print. Arrange in four-patch arrangement as shown below (3). 6. Sew the top two units together and press seam open. Sew the bottom units together and press seam open. Sew the two halves together to complete the block. 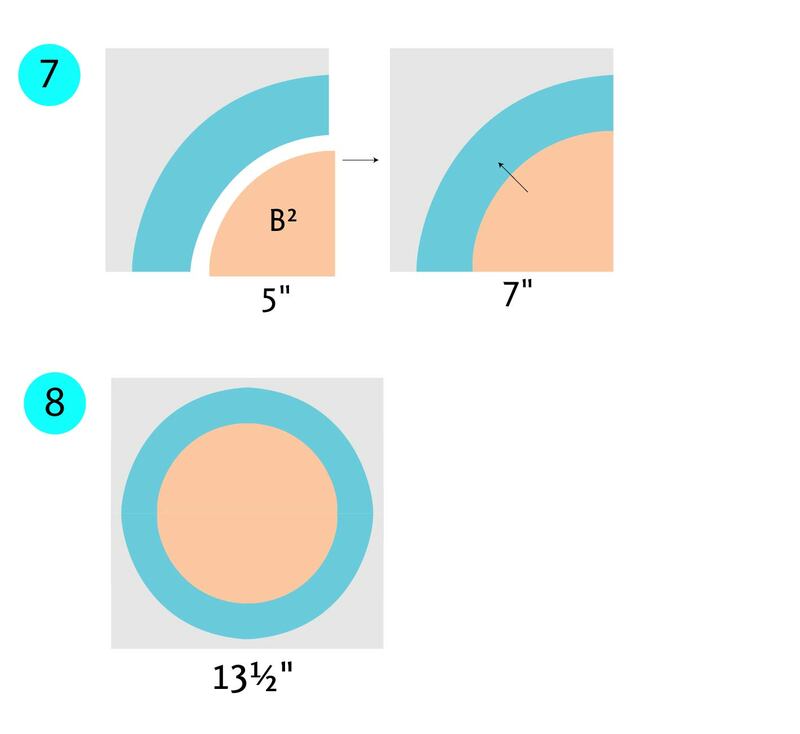 Make four 13½ circle blocks. 7. Match each blue C shape with a white A shape. 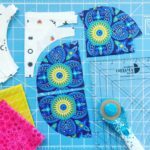 Use the same technique as in steps 1-3 to sew the curves. Press toward the white. 8. Trim the points of the blue fabric even with the white fabric at the ends of the curves as shown above in illustration 4. 9. Trim to square the unit to 7″ square as shown above in illustration 5. Leave ½” of white fabric to the outside of the blue fabric at the ends of the curve. 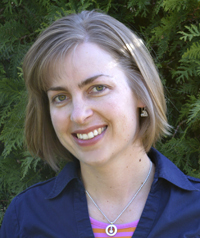 You will trim approximately 1/4″ from the blue sides of the block. 10. Place one A/C unit on the cutting surface. 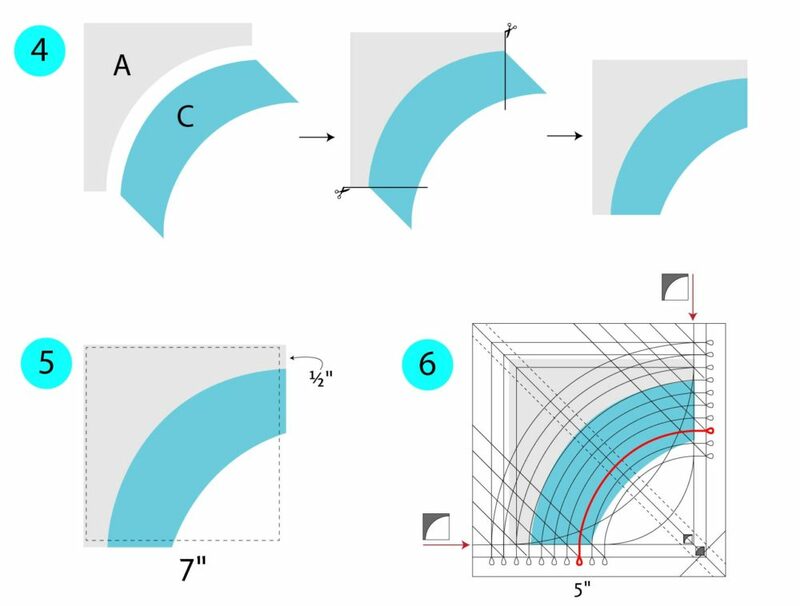 Place the CCR over the fabric so that the blue sides align with the lines on the ruler for cutting the concave shape as shown above, 6. 11. Use the 5″ groove to cut the curve. Cut all of the A/C units in this way. 12. 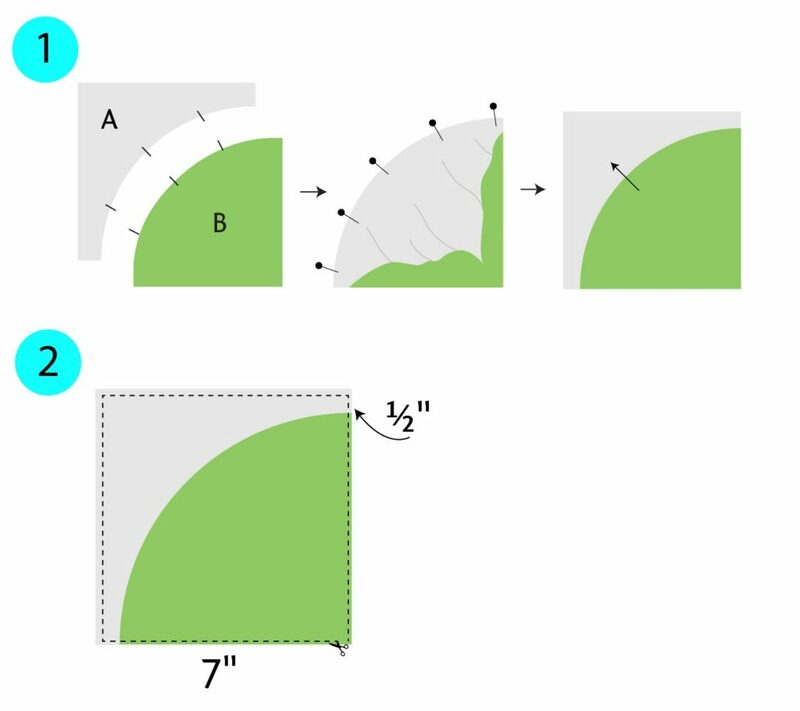 Match a print B² shape with an A/C unit and sew the curve using the same technique as steps 1-3 above. Press toward the blue. Blocks should measure 7″ square. Make four of these units with matching print (B2) fabric (illustration 7 below). 13. Arrange four matching units in four-patch arrangement. Sew the top two units together and press seam open. Sew the bottom two units together and press seam open. Sew the two halves together to complete the block. Press seam open. Make five 13½” blue circle blocks. See illustration 8 above. 14. Arrange the blocks to make the quilt top as shown in the quilt layout diagram below. 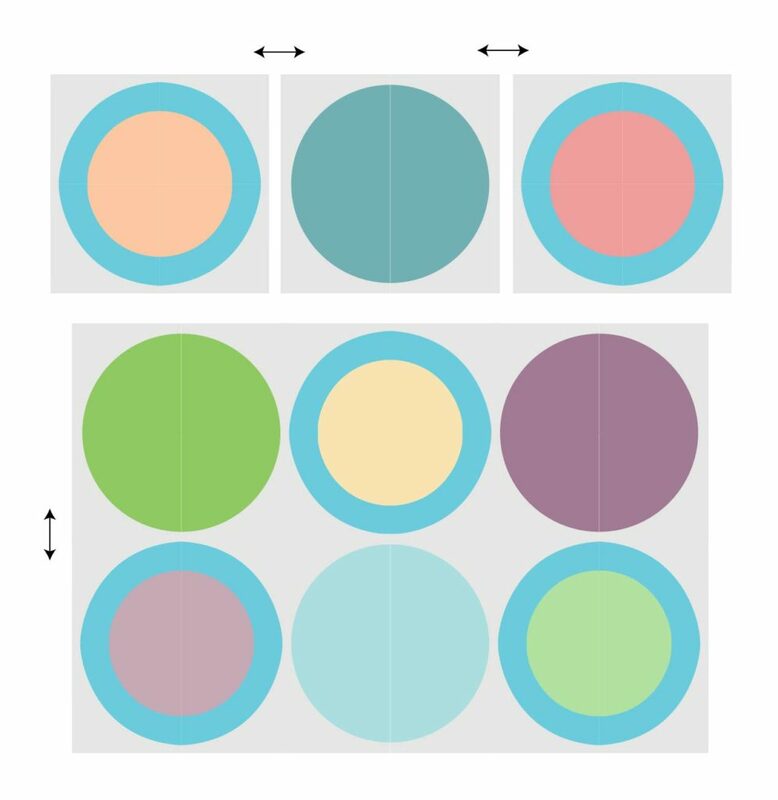 Alternating the blue circle/print blocks and the simple circle blocks. Sew the blocks together to form rows and press seams open. Sew the rows together to complete the quilt top. Press seams open. Ta-Da! you did it. This is such a fun design, and I hope you all make it in your favorite fabrics. If you missed it, I posted about how to I quilted my sample. You can read about that, Here. 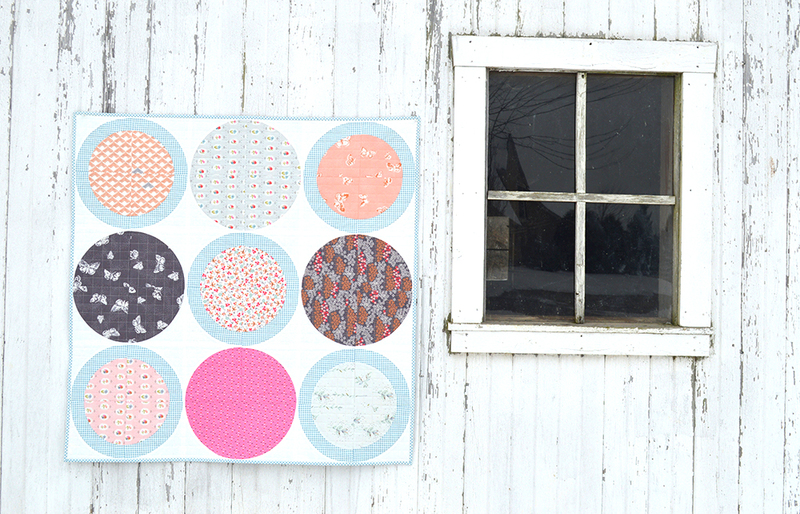 You’ll find binding tutorials Here for finishing up your pretty quilt. You’ll get all the news and offers (plus freebies!) when you get Color Girl email. Sign up today!